Quiet Seclusion at a Working Ranch! If you're looking for a quiet getaway offering a more unique experience, the HD Ranch guest house is the place for you. This extremely charming 1200 square foot vacation rental home sits at the end of a mile-long driveway that cuts through 100 acres of pasture land. The guest house features a tastefully decorated master bedroom, living room, library and kitchen with a loft containing two additional beds and sitting area with tv and DVD player. Outside you have a porch and a deck with outdoor furniture and another deck with a hot tub. Watch deer grazing in a nearby pasture while soaking in your private hot tub; wander through our exquisite flower garden; or simply kick back and enjoy the serenity. After unwinding, take advantage of some of the country's best mountain biking and hiking trails, white water rafting, fishing or one of Durango's exceptional dining experiences. Also great as a hunting base. I am a 69 year old woman who has been training horses and teaching horse back riding for 40 years now. I have this ranch for the love of horses and the beauty of Colorado. I am an avid hiker and also breed Black and Tan Coonhounds who love to share their love for the many guests that come and visit. I thank every guest who comes and visits and have met so many wonderful people! I am so ever grateful. If you want a very unusual getaway and enjoy the beauty of this area with 360 degrees views of the mountains and mesas plus view much wildlife and of course the beautiful horses eating in pastures. Everyone has told me that the guest house is much better than the pictures. You have your own deck to view the wildlife and a hot tub to watch the stars. Inside it is warm and inviting to relax. Everyone says they have never relaxed more than when they are here. Many enjoy walking the ranch and enjoying the views and horses. 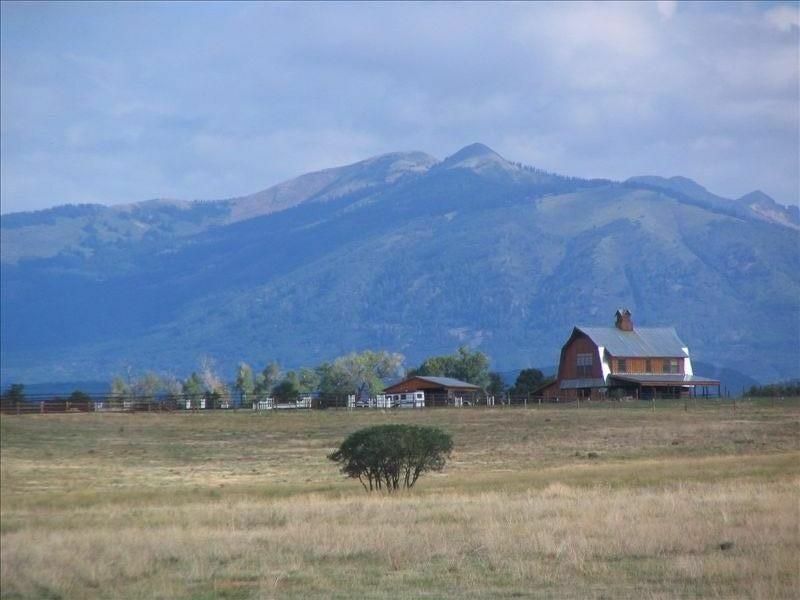 Beautifully groomed ranch with incredible views! My husband and I were looking to get away from the city to celebrate my birthday in the peace and quiet of the country. After much searching, we came across this property and because of all the good reviews, we booked it. We are so glad we did! When we arrived we were in awe at how pretty everything was. We almost couldn’t believe we were really going to stay there! We both love dogs and were excited to meet the hounds we heard so much about and they didn’t disappoint! They were so sweet and welcoming and Francie even provided biscuits for us to give them. They showed much love and we were happy they came to visit each morning and evening. We spent both evenings gazing at the bright stars from the private hot tub and deck. The cabin layout was perfect and it was so clean with such cute decor. Durango is only 15 minutes away and has great dining and shopping. We had such an incredible time, we will definitely be coming back as soon as we can! This was the perfect location. We were 30 minutes from Durango, and hour from Purgatory Point and Mesa Verde National Park, and 1.5 hours from Hovenweep National Monument and the Four Corners Monument. The cabin is quiet and secluded. Great views and natural light. A gas stove is cozy and warms the cabin perfectly. The hot tub is a huge plus with an amazing view of the stars. The hound dogs are just icing on the cake. We loved having them visit and would drop everything to give them biscuits. A few notes: There is a DVD player, not Blu Ray. Bring movies...or rent redbox in Durango. There is a small water heater. Quick showers are key. We waited 15 minutes between showers and had no issues. The cabin is on well water that has a strong smell. We just ran the fan and it didn’t bother us. There is filtered water available at all sinks. We absolutely recommend staying here and look forward to visiting again. We thouroughly enjoyed our stay at the ranch. We Are looking forward to returning and spending time in the Durango area. The cabin and especially the location are beautiful! Francie was a great host, and we’re thankful for her letting us stay out at her ranch. It was a secluded place nearly surrounded by beautiful mountains and the cabin was great. We’d come stay here again. Thank you! When we arrived, the walkway was shoveled free of snow and the gas fireplace was already going so the cabin was warm when we entered. The cabin is cozy, quiet and relaxing. We so enjoyed being greeted by the four hound dogs each day and walking all over the property. The horses were very friendly and allowed us to pet them. The cabin was well equipped with everything needed and if we needed something or had a question, all we had to do was text Frances or her foreman and we would get a quick response. We were especially grateful to Mark, the foreman for jumpstarting our truck and shoveling the snow out from around it so we could leave each day as well as making sure our parking spot was shoveled free of snow so we could easily park upon returning. We had plenty of water and everyone was respectful of our privacy and accomodating so I don't understand some of the other bad reviews. We plan on returning here many more times and bringing family. The cabin was very awesome. Equipped well, awesome gas fired wood stove and decorations, great property and scenery and a hot tub! Wonderful stay. We would go again. The ranch is located just 14 miles from Durango and the famous Durango Silverton train and many outdoor activities ie. rafting, fishing, hiking, walking, skiing, rock climbing, jeep tours, cross country skiing, cycling both mountain and road. Only 35 miles away is Mesa Verde National Park and you can also visit the four corners monument. From the ranch you can drive the Million dollar highway that takes you from Durango to Silverton to Ouray to Telluride and back to the ranch. I am an avid hike so I can inform you of many of the great trails in this beautiful mountain range. Also great shopping and dining in the quaint old town of Durango. Sorry no outside pets are allowed on the working horse ranch. Also a side note that the cabin can accommodate four guests comfortably and please inquire with owner if you have questions about adding another guest or infant. Nightly rates are for two guests with a minimum rate for guests over two. Thank you.